Fabulous condition, extremely well maintained and very low hours! 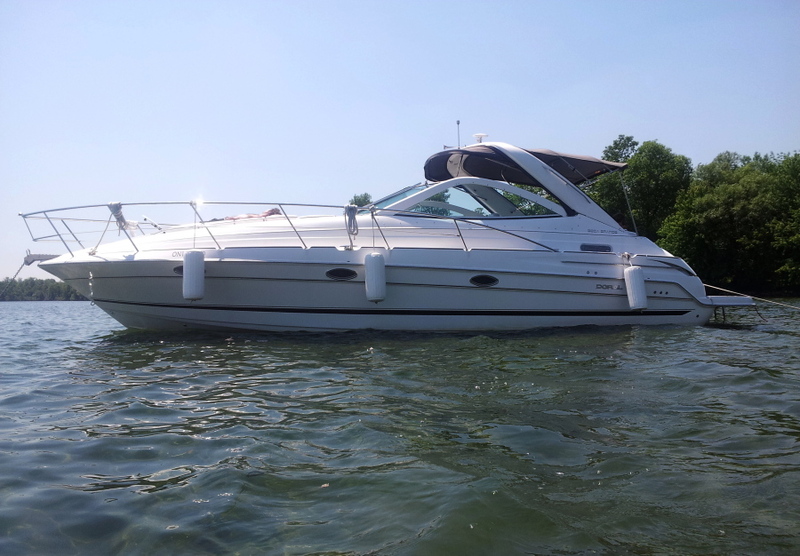 This freshwater Doral Boca Grande is in beautiful condition, has very low hours and is fully equipped for comfortable cruising anywhere. The expansive swim platform boasts a hidden swim ladder, transom mounted fender racks with integral steps up to generous side decks, storage lockers, a post mounted BBQ and centre transom doors to the well designed cockpit. Enjoy making snacks and drinks at the cockpit refreshment center where there is seating for many on three comfortable settees or the doublewide helm seat. Molded steps and the walkthrough windshield take you to the foredeck where you can enjoy the view from the large sun pad area. Head below decks to the well appointed galley where you will enjoy the full size fridge/freezer, two burner cook top, microwave, ample storage cupboards and hidden drawers. Two steps take you up to the comfortable bed and forward berth, a portside make-up station, starboard hanging locker and an accordion privacy partition. The rotating TV serves both the salon and forward berth areas. The mid cabin and convertible salon settee provide additional sleeping areas, and there is excellent ventilation through several opening portlights and three overhead hatches.